This album was recorded in response to an overwhelming demand for a follow up to 'In A French Cafe'. It contains another 15 French chansons sung in English and French with the addition of a jazzy double bass and some three-part harmony vocals. It includes a stunning arrangement of The Habanera from Carmen, a new version of the theme from A Man And A Woman, a soulful rendition of Ne Me Quitte Pas in the manner of Jacques Brel and even one song in French AND Italian: the well known Parlez-moi d'amour (Parlami d'amore Mariù). Plus Lorkin's own charming "Parisian" waltz about herself and Piaf, Edith et moi, and songs by Charles Trénet and Michel Legrand. Listen to this CD and find out. 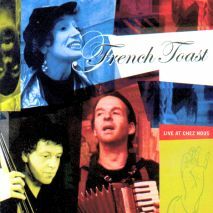 "More French than the French", the trio of French Toast features Linn Lorkin, chanteuse, Hershal Herscher accordéoniste and Pierre Scott, bassiste. All content copyright © 2000-2008 Rouge Records Ltd. Web design and hosting by Simply Effective.